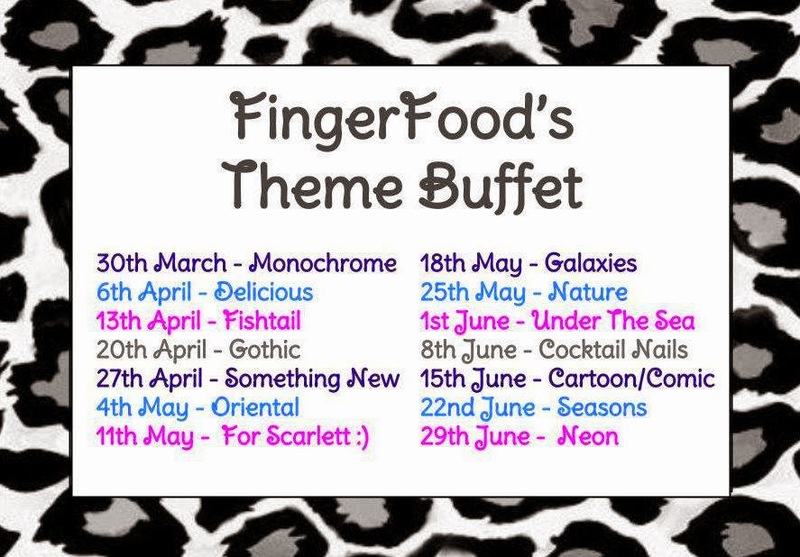 It is FingerFood's Theme Buffet: Neon nail art challenge. Hosted by the lovely Sam. 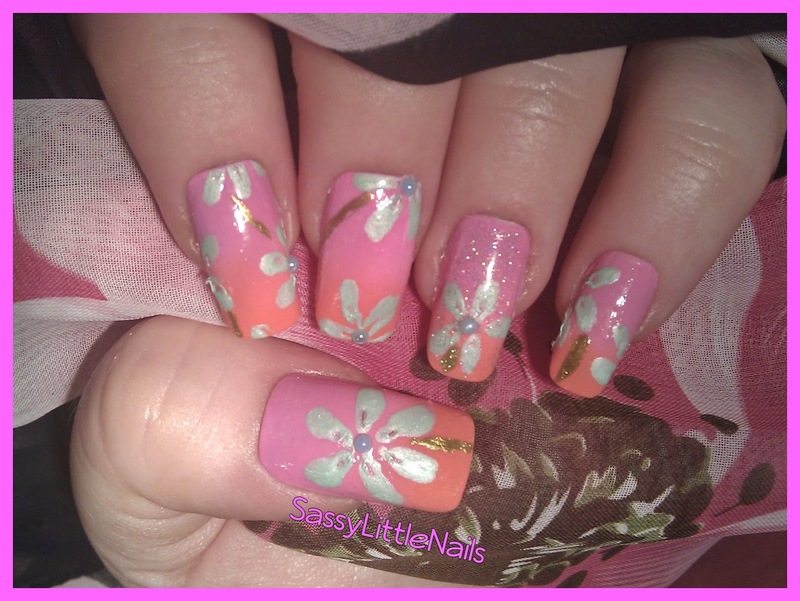 I decided to pick 2 of my favourite Neon polishes and do some floral pattens. Saffron polish (no same) Dark Blue. 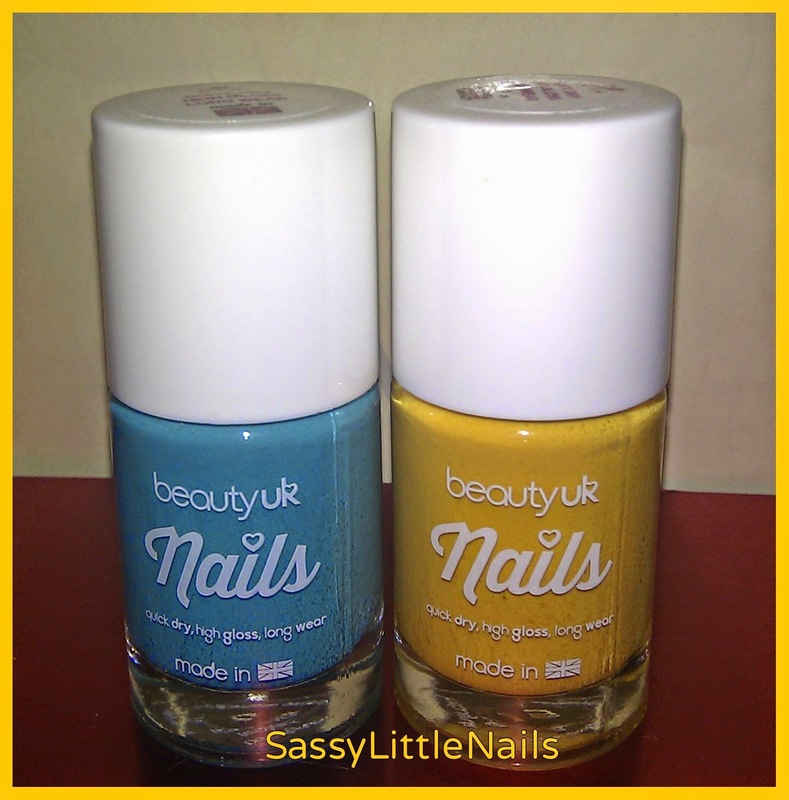 Barry M paints polish in 236 Neon Yellow. W7 polish in Its Pink. 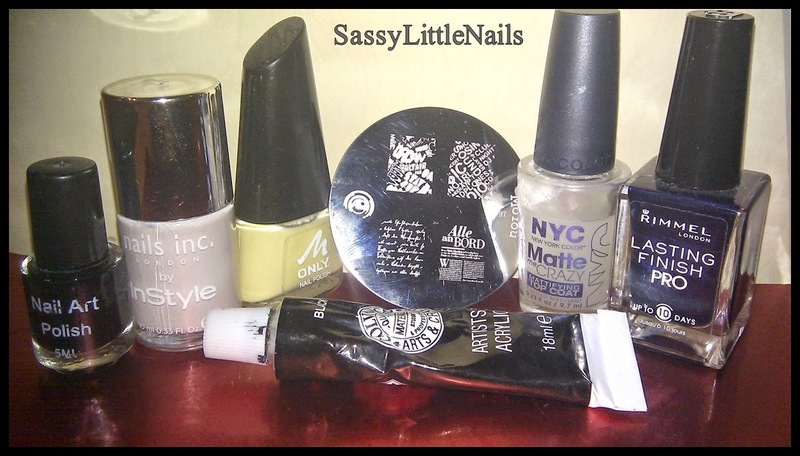 Barry M Base top coat & nail hardener. Sally Hansen Sugar coat polish in Treat Heart. Studio London polish Glitter top coat (no name) Black&Gold. I used the Barry M base top coat then the Saffron polish as a dark base coat. On the little finger once the dark blue was dry I went over the nail using the gold/black glitter topper. I also used the Sally Hansen polish on the ring finger. I gave all the nails about 3 coats of polish. 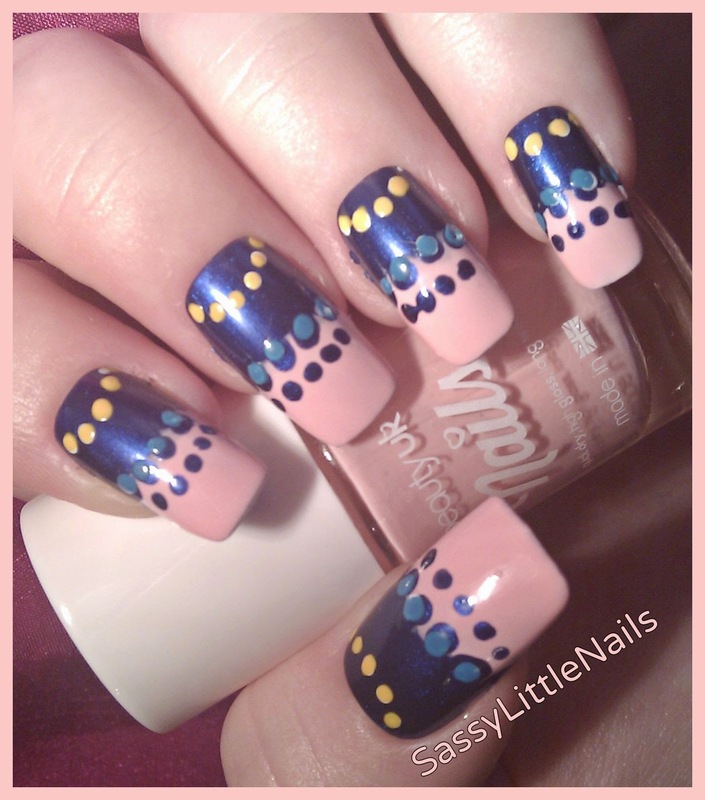 When fully dry I then started to make flower petals using my dotting tool and the white polish so the neon would stand out more. I carefully dragged a orange stick in the centre or the petals to give a petal look. Then when fully dry I then went over the white polish using the W7 polish and the Barry M polish. 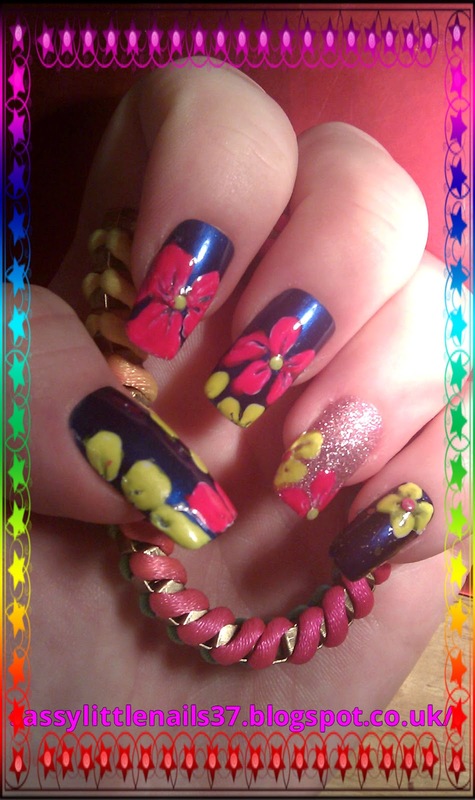 I dabbed a little of the top coat in the centre of the flowers and added the neon beads. Hope you enjoyed my Neon nail art! 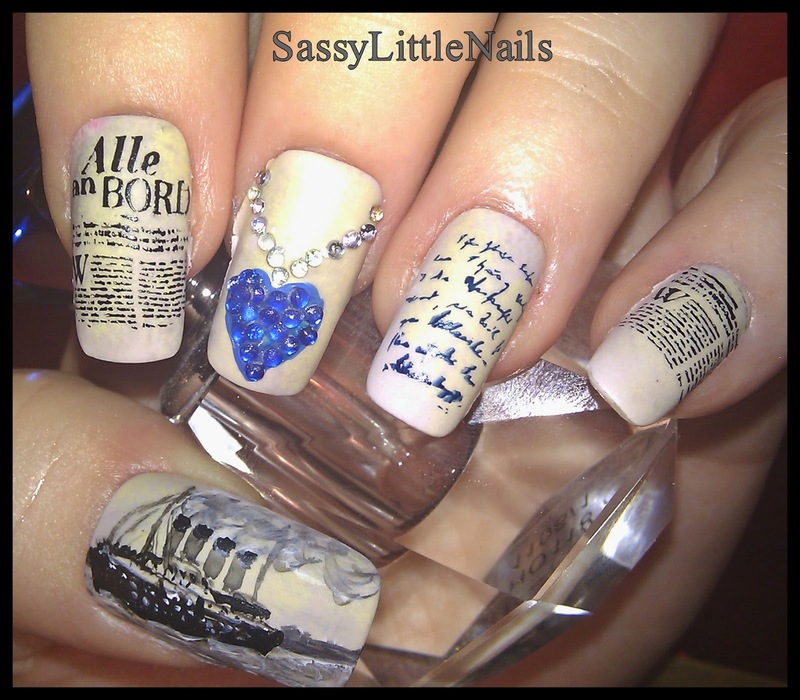 Thanks for reading and if you haven't followed me yet I would love you to, and please check out the wonderful manis below! Have you all had a good week? my week has been busy. I did want to picture all of the delights I bought but my camera has been naughty and wont play nice. TarasTalons opened in April 2013 and is the UK’s oldest handmade indie polish brand! All TarasTalons polishes are one off, limited edition or custom. The polishes are of excellent quality and beautifully made colours.they came perfectly wrapped and secure. My TarasTalons Team Welcome package! Saffron polish (no name) silky mint pastel green. Saffron polish (no name) silky Olive/goldish green. 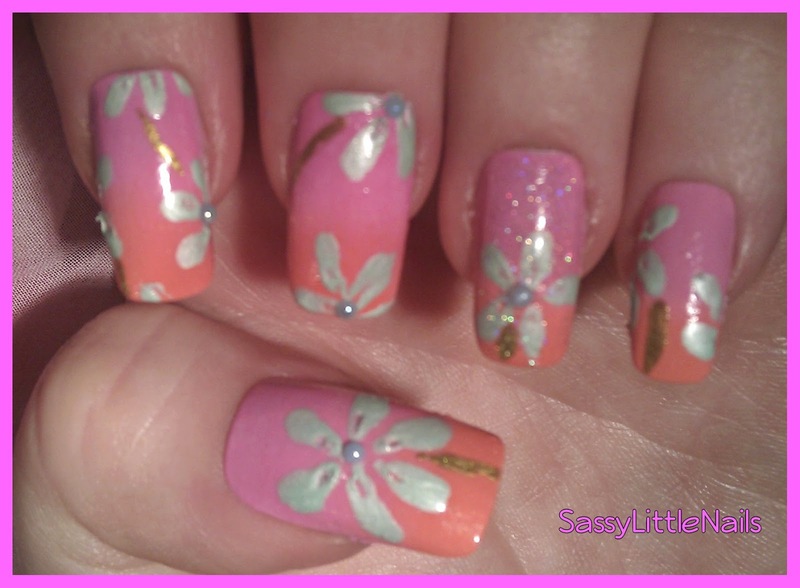 I wanted to do a summery floral manicure using the 2 beautiful shades of polish Tara made. so I decided to do a gradient effect with flowers. I started with a base coat (white) then I took the make-up sponge and painted across the 2 shades of polish and applied the sponge to each nail. I repeated this step about 2/3 times. Once the polishes are drying I went over them with the clear polish to blend the colours. I then took my dotting tool and made some flower shape petals using the Saffron mint green and the Goldish/green polish for the stems. applied a small dot of clear polish to the centre of some flowers and added the pearl beads. For the ring finger I went over with a glitter topper Tara made called Fairy (sorry not pictured)then added a clear top coat to seal it all. I will be picturing all my TarasTalons polishes shortly with some more nail art! I hope you liked my TarasTalons mani! Thanks to Tara for sending me my bloggers TarasTalons welcome package and for making such wonderful polishes. 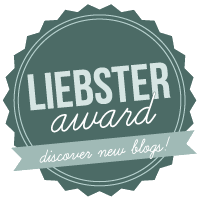 Thanks for stopping by please follow my blog if you haven't already Thank you :) Have a fabulous Weekend! Qfiber Heat Wrap Pad REVIEW! I hope you all enjoying the sunshine! 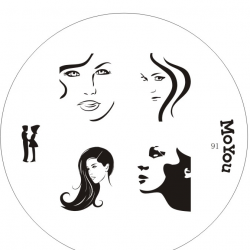 We provide a range of innovative health, beauty and fitness products to UK and worldwide consumers. You will note we have a fairly limited range and this is deliberate because we find that, quite frankly, there is an awful lot of tat out there which you can buy but which is of very little use. Each of the products we supply has been personally tested by us for quality and effectiveness. In addition, where there are competitor products available we test all those too in order to determine which product is the best combination of quality, effective product and good price. 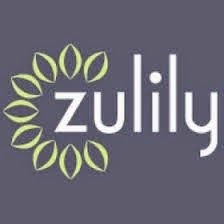 Firstly let me share some information with you about the product and then I will share my thoughts and give you my review. Qfiber is the most advanced heat wrap/heating pad on the market today. Qfiber heat pad is a high-tech therapeutic contoured body wrap that delivers safe Infrared heat therapy in your car, home, office, computer (USB), or on the move with a lightweight battery pack. Qfiber heat wrap is used by individuals for soothing relief from pain, muscle tension and stress. If is regularly used by a wide range of people who may have arthritis, muscle, joint or back pain. And athletes use Qfiber heat wrap for injury recovery, circulation improvement and performance enhancement. Infrared is the safest and most naturally healing form of energy. Infrared energy penetrates up to 2” inches into exhausted muscles. This means the Qfibre heat wrap works deeper than any other any other form of heat therapy. Also, it does not give off harmful Electro-Magnetic Frequencies (EMF’s) like many traditional electric heat pad products. 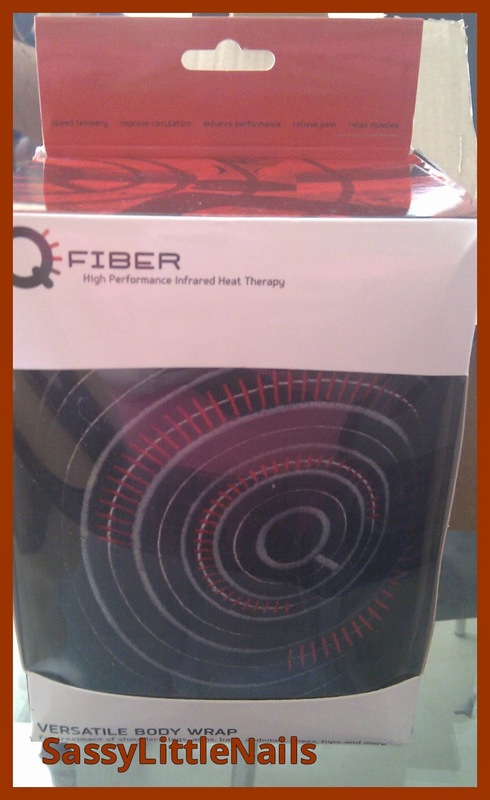 The Qfiber body heat wrap combines a special Infrared heating coil with Qfiber fabric that disperses therapeutic heat all around the treatment area. You can use the Qfibre heat wrap to treat: knees, legs, elbows, arms, ankles, shoulders, and just about any part of your body. It also includes an extra strap that can be attached so that it can be used to treat the lumbar, back, abdomen and hips. The gentle heat of the far Infrared ray goes deep (up to 2 inches) into your tissue to relax your back, joints and other large treatment areas. The Qfibre heat wrap is versatile and you can use it in the car, relaxing on the sofa, working at your desk or on the go. Another unique feature of the Qfiber heat pad is you can choose how you power it. You can run it off a USB lead from your computer; the cigarette lighter in your car or a mains socket. And you can use the lightweight battery pack (fits 4 x AA batteries) that comes with it so you can use it on the move. One size fits all, up to 52" waist with extender straps. USB or 12v or 240v or Battery powered. Battery pack included. Versatile and portable. Wear anywhere. Connect anywhere. Patented Qfiber fabric disperses heat evenly. Emits high levels of safe Infrared therapy. Let me tell you a little bit about why I reviewed this product a few year's ago I had injured my lower back and slipped a disk.ever since I have suffered with back pain on a daily basis. now no product can take away pain fully it is only an aid to help ease pain and tension. The backlife product I use on a regular basis to help ease that pain and I highly recommend it if you have back pain. The Qfiber is a heat wrap that you can wrap around any body part that needs soothing through heat. I was looking for a heat wrap product that I could use when I am on the go and especially when I am doing the weekly food shopping lifting heavy shopping bags can really cause my back to spasm and hurt! For a while when I was shopping or on the go doing daily chores etc I was wearing the cheap throw away heat pads that stick to your clothes and lasts for up to 8 hours now the problem with them was that I found the heat was not strong enough to help sooth my pain when I was active I also found the sticky back plastic on the pad was making some of my clothes bobble and sometimes the pad would fall off suring the day if it would not stick properly to certain fabrics. So..This is were the QFiber comes in! This is a fantastic product for being on the move either walking / shopping/ in the car/ bus traveling I could wear the heat wrap anywhere! thanks to the added Lightweight battery pack and the Car charger! The wrap is easy to set up and adjust to your body part mine was around my lower waist/hips I used the2 removable velcro straps to make it nice and secure around my waist clipped the battery pack and I was good to go! When I first used the wrap I plugged it in to the mains the power cord is long enough to use in bed or relaxing on the sofa I placed the wrap around my waist lumbar, back. The range of power options are good as you can manage the level of heat to your level of pain, as my pain can vary from day to day. 20 - 30 minute exposure reduces the aches and pains significantly for me It is mildly hot,and if my pain was bad I was continue the use up to an hour. I use this along side my backlife and they both are a fantastic aid. I found using the Qfiber for a few weeks everyday at different times during different levels of pain the Qfiber heat pad has helped me achieve doing more in my daily routine that sometimes I could not do if I was not wearing it. I could get on with my chores and such and for me the main thing thing was when I was out and about on the go I had that constant heat helping me while I was active. The battery life only lasts depending on the type of batteries you use I used re-chargeable ones and found I got a few hours worth of relief while on the go. The only tiny negative I have is the wrap can look obvious if wearing white or a light colour and slightly bulky under clothes depending if you are wearing a thin garment. for me this was not an issue as when I was on the go I would hide the belt under a top/dress and a cardigan. Overall I highly recommend the Qfiber for anyone who wants to ease muscle pain. Thanks again to Paula and JD Harris for sending me this wonderful product to review I truly love it! Unfortunately I have missed a few of the themes for FingerFood;s Theme Buffet nail challenges with not being well lately however this weeks theme Cartoon/Comic was prompted by me! so I could not miss this one. 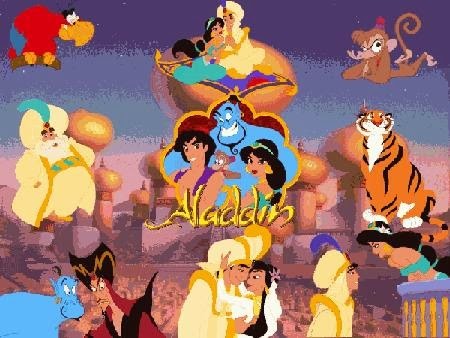 I decided to do one of my favourite Disney animated movies Aladdin. 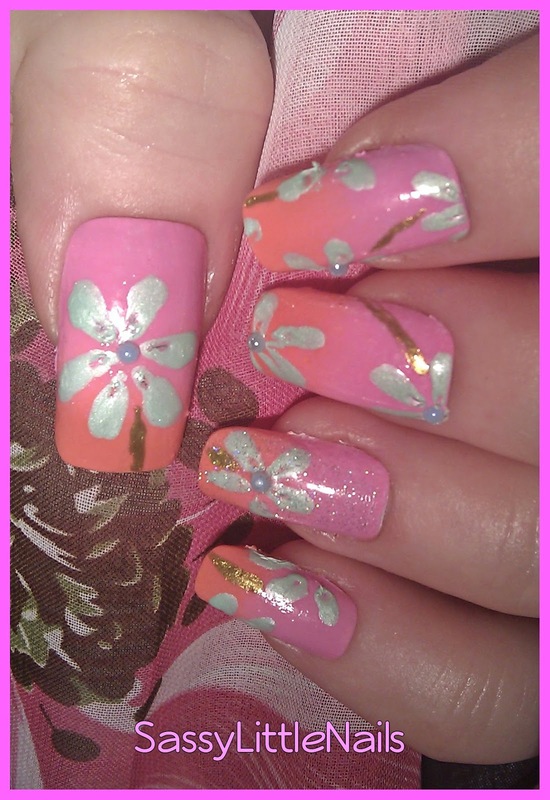 I hand painted this nail art manicure using Acrylic paints and a clear top coat to seal it. 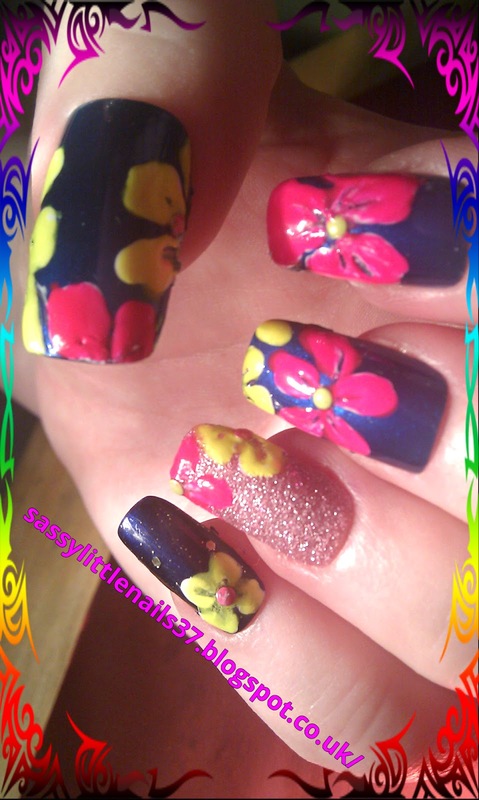 I enjoyed doing this mani was fun to do the little finger is the magic carpet colours. 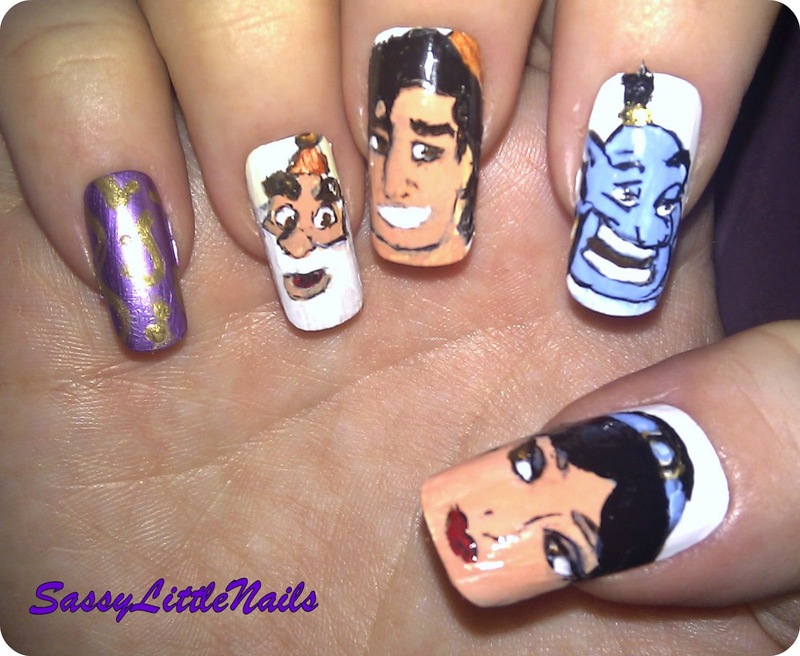 Hope you enjoyed my Aladdin nail art! Sorry I have not posted recently I have been unwell and my back has been rather painful past few days but apart from back pain I am feeling better I hope you all keeping well and enjoying the warm weather! 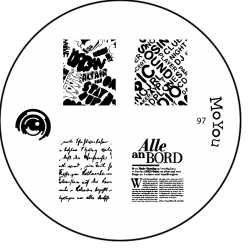 Moyou plate no 91 and no 97. TarasTalons glitter topper polish in Fairy. I started with the TarasTalons polish in Sugary sweet.then on the ring finger I used the Burgundy polish.I stamped the ring finger using the Gold polish. 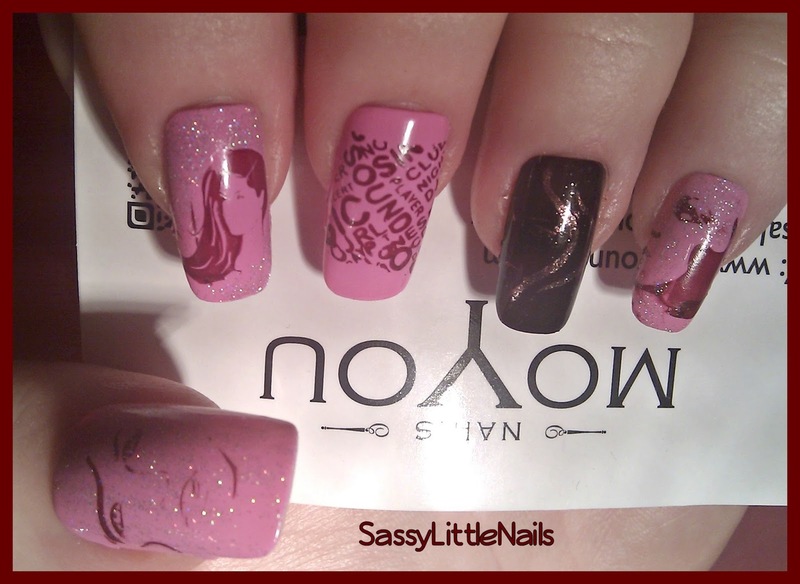 Once completely dry I then took the burgundy polish and used the stamping set and the Moyou plate no 91 and stamped some faces on each nail apart from the middle finger I stamped words using the Moyou plate no 97. When dry I then went over some of the nails with the Fairy glitter polish and then sealed with a top coat. 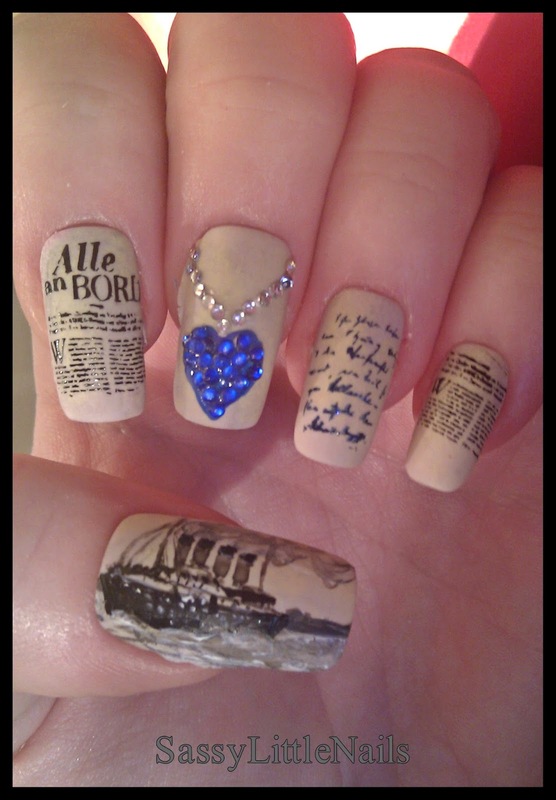 This manicure I wanted to do something rather special so I had this idea of doing some nail art relating to the famous ship RMS Titanic. 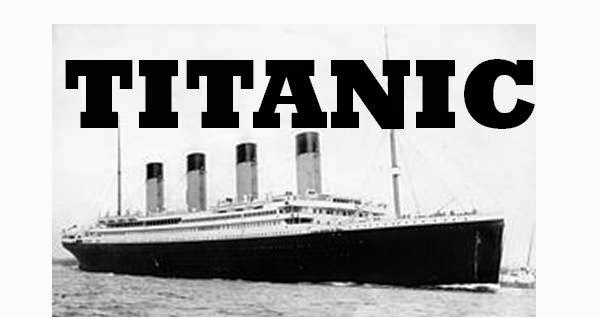 RMS Titanic was a British passenger liner that sank in the North Atlantic Ocean in the early morning of 15 April 1912 after colliding with an iceberg during her maiden voyage from Southampton, UK to New York City, US. The sinking of Titanic caused the deaths of more than 1,500 people in one of the deadliest peacetime maritime disasters in modern history. 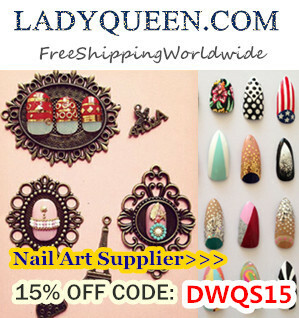 Below is the list of items I used to create this nail art. Nail art ink polish in Black. Nails inc polish in Sao Paulo Streets. Manhattan polish (no name)pale yellow. Rimmel polish in Midnight Blue. Acrylic paints in Black and White. 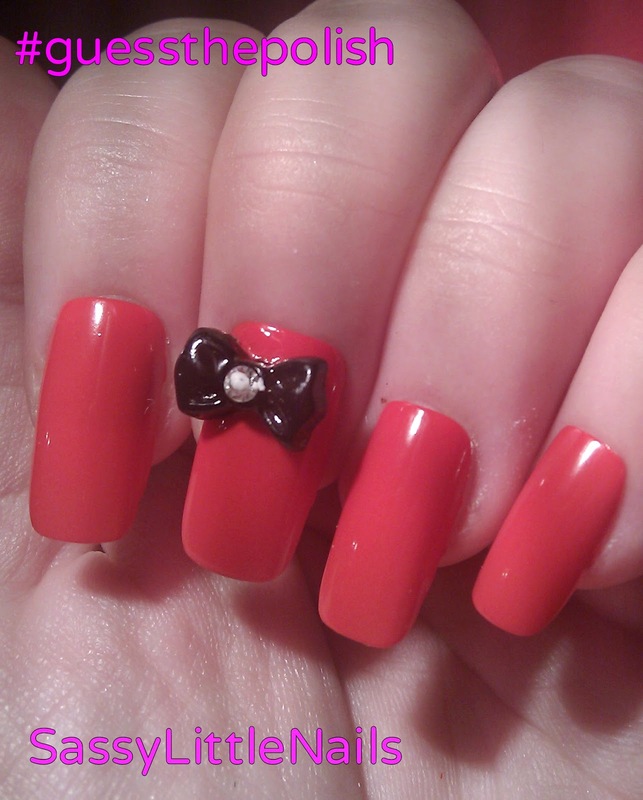 I started with using a base coat first by using the Nails inc polish on all nails. When dry I then used a small make-up sponge and dabbed some of the Manhattan polish over the nails before allowing it to dry fully I then went over the nails with the Matte top coat to blend the colours to give it an old newspaper effect. I waited for the nails to dry fully then I started with stamping of the letters and news article on the plate I stamped the pointer finger ring finger and little finger. I used the Rhinestones to create the necklace and sealed with a clear top coat. For the thumb I used Acrylic paints and I hand painted the ship Titanic. Hope you enjoyed my 2 manicures today. 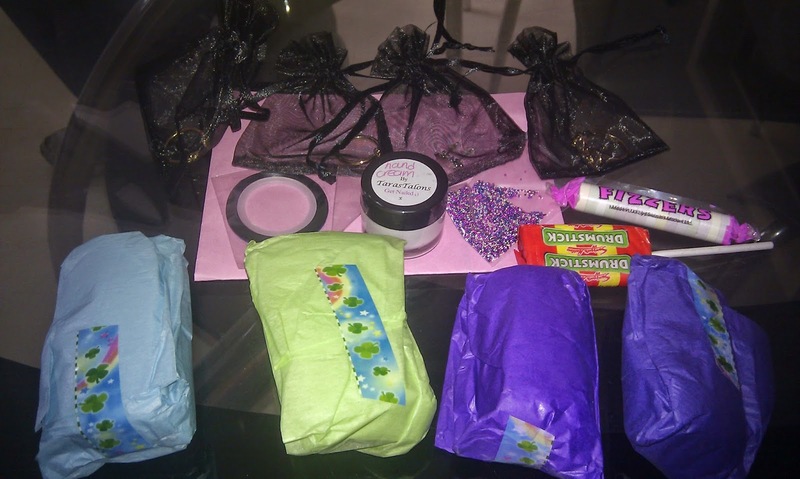 Many thanks to Selina for sending me the products to review. More posts coming up this week! I hope you all had a wonderful weekend? 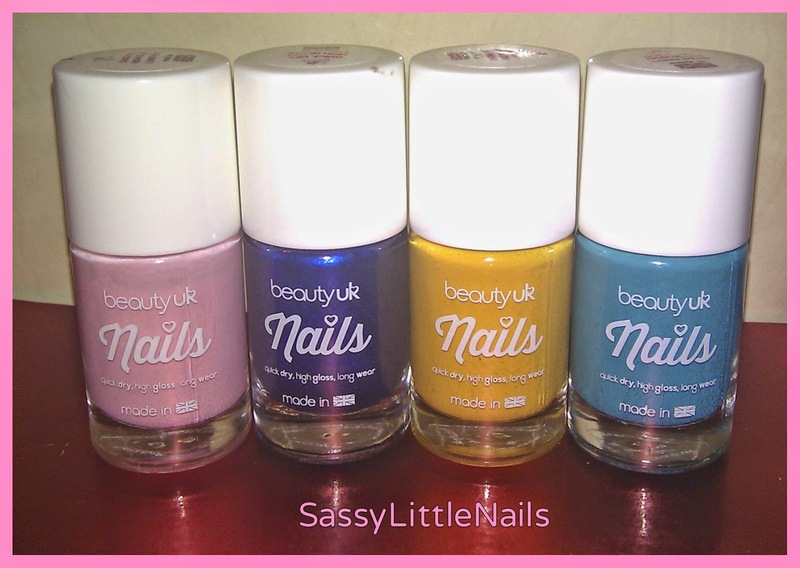 I recently did a #guessthepolish giveaway on my blog and I can now reveal that the polish brand is in fact BeautyUK. Well done to those of you who guessed correctly however there can only be one winner! 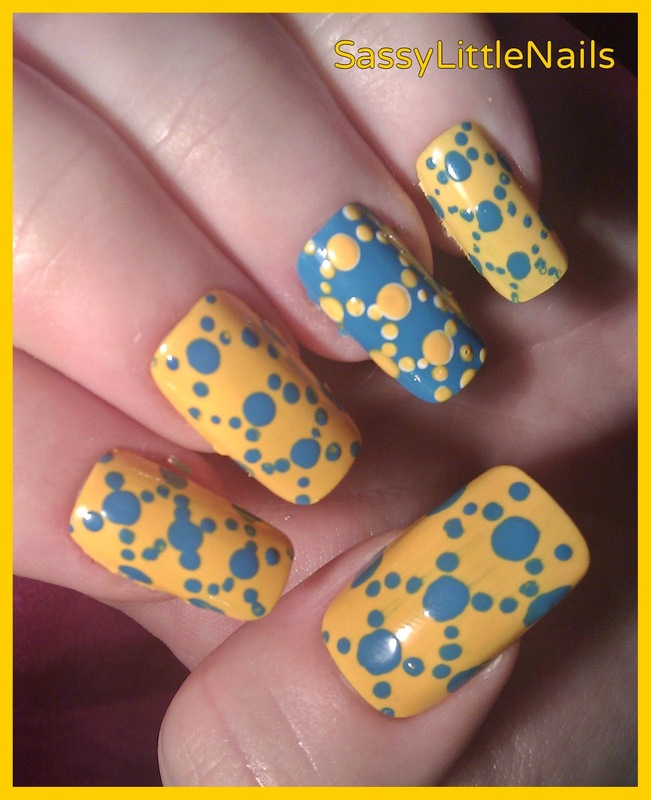 Congratulations to Darlene R, who has won the #guessthepolish ‎giveaway‬! 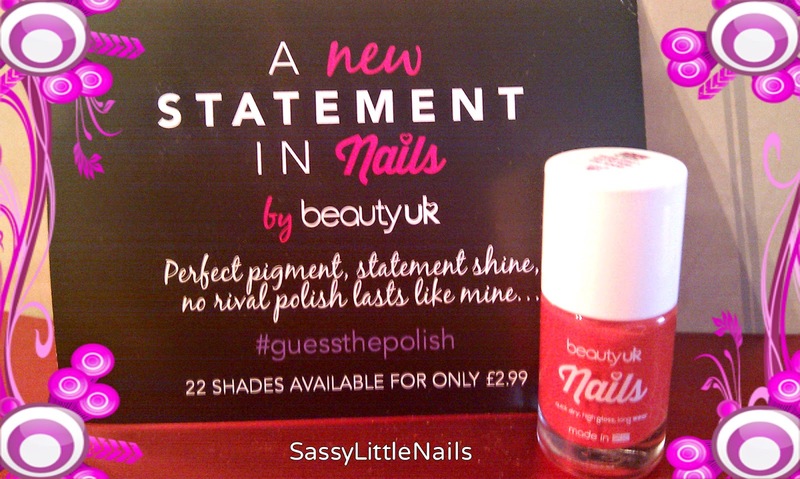 , please e-mail sassylittlenails@hotmail.com with the subject line '#guessthepolish winner' with your address and I will get your prize sent out! Thank you so much for all your entries, My next competition will be announced soon! 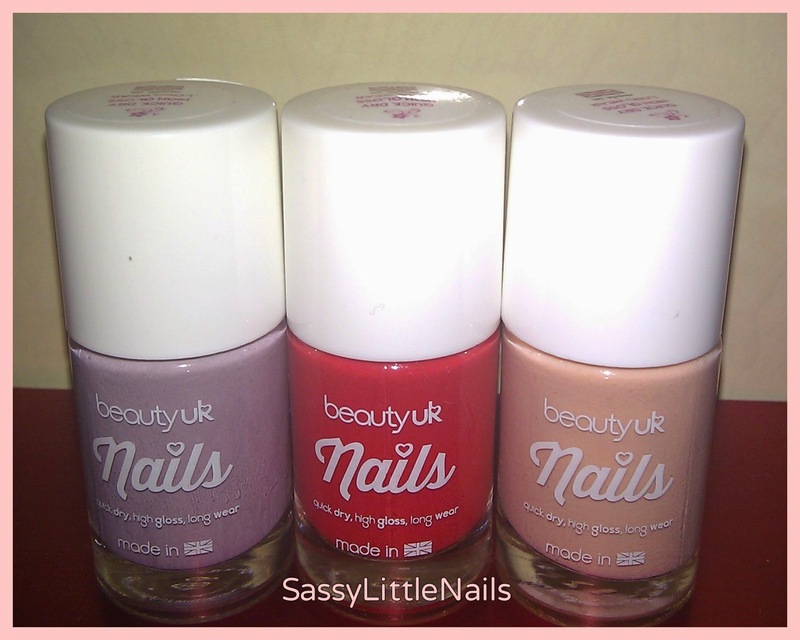 I was kindly sent some new polishes to review by beautyuk. The new flagship nails collection boasts 22 statement shades of quick drying, long lasting, high gloss nail polish. This amazing all-round formula has been developed to offer the perfect balance of coverage, colour, shine and wearability. Each shade is easy to apply and delivers intense coverage that will last for days without fading or chipping. I was sent all these 7 shades. no.18 - great blue beyond. no.3 - let's hit the peach!. I love this brand anyway but this new collection is amazingly good! I found after wearing the polishes for a few days it did not chip or fade. The colours are vibrant and bright for the summer months the shades are all so pretty I want to collect them all! I created some nail art that is easy for anyone to do! First mani is the #guessthepolish shade of no.15 - coral burst.On the middle finger I added a nail art bow in black to add a little glamour to this simple look! 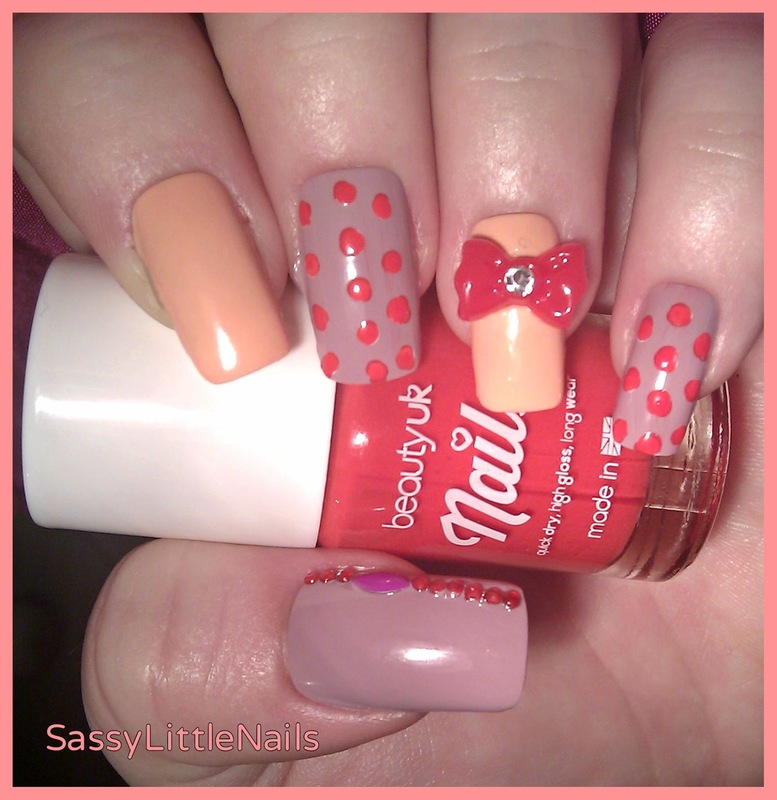 Next manicure is an easy to do poka dots. I used these 3 shades to create this look. lady lavender. coral burst. let's hit the peach. I painted the thumb and middle and little finger using the lady lavender,I then used the let's hit the peach on the pointer and ring finger. 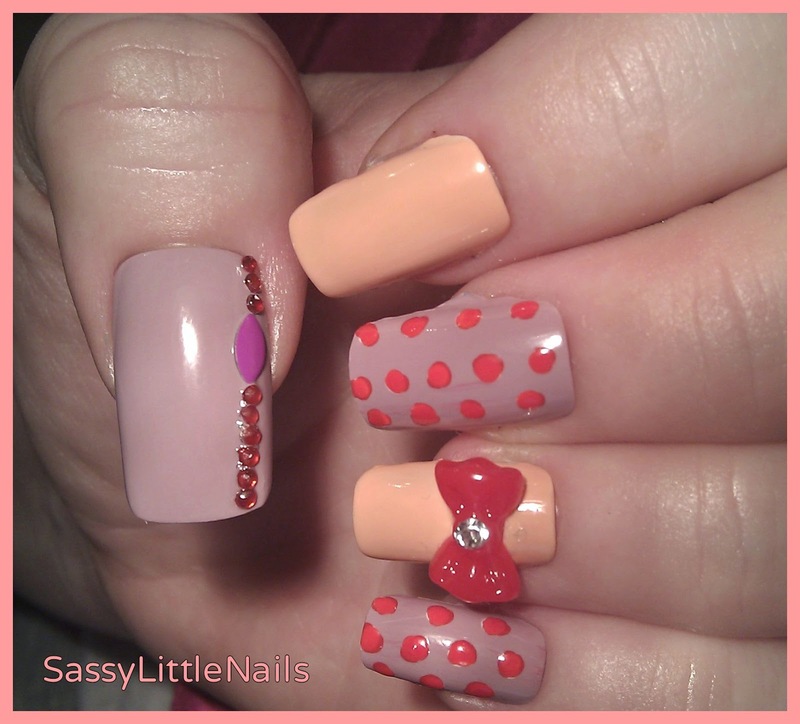 I used a dotting tool and simply dotted around the middle and little finger using the coral burst polish.I added some red rhinestones and bead to the side of the thumb nail along with a red bow on the ring finger. to finish the look. I used tealed with a kiss and daffodil delight. and 2 dotting tools one small one medium size. I applied the daffodil delight to all the nails apart from the ring finger I used the tealed with a kiss. 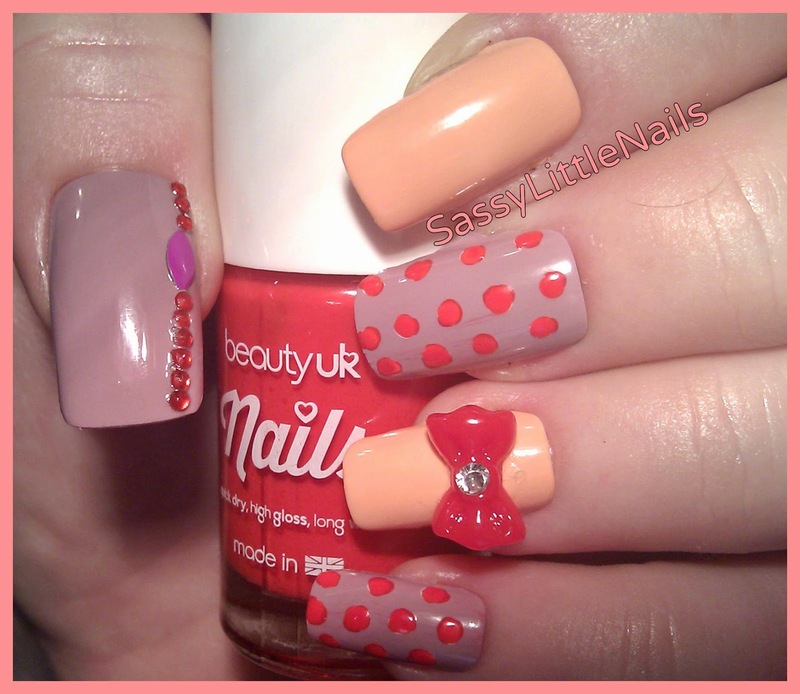 On all the nails I simply made 3 large dots in the centre of each nail and then going in zig zags I did smaller dots. 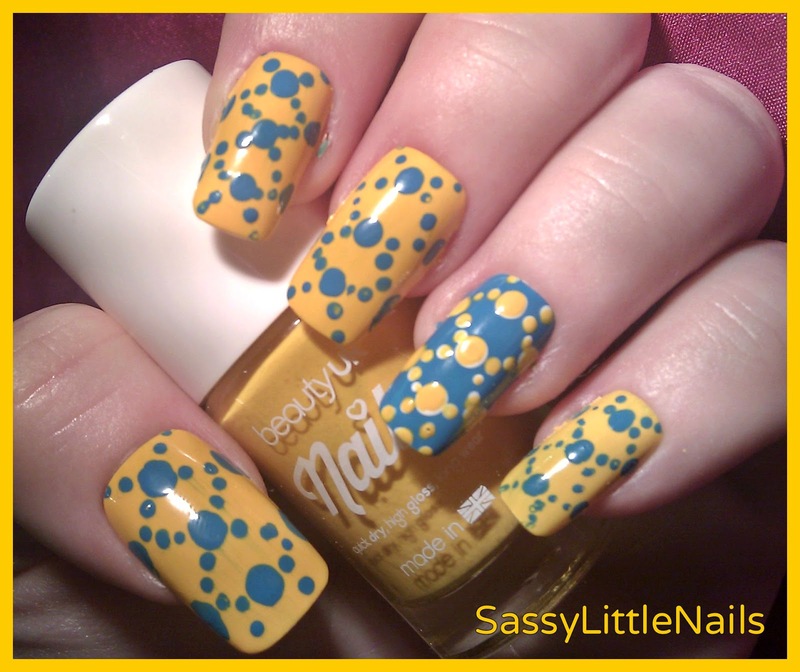 I did the same for the ring finger using the daffodil delight polish for the dots. 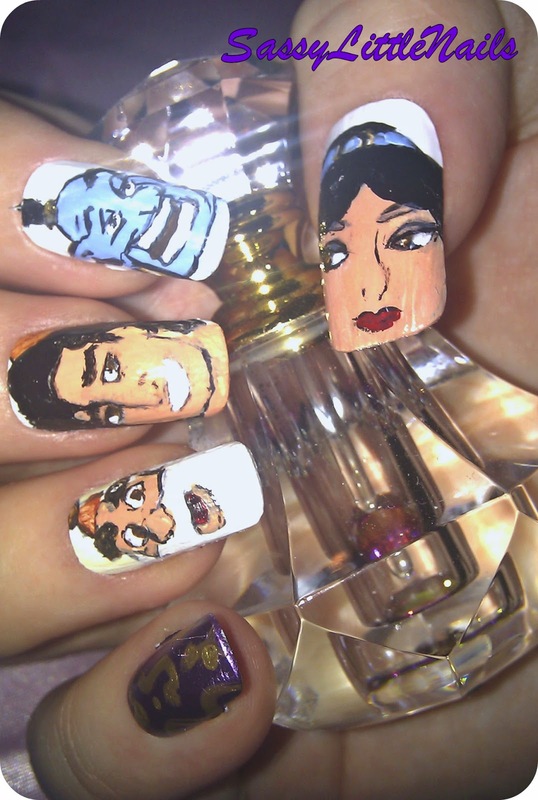 Such an easy nail art to do and fun! 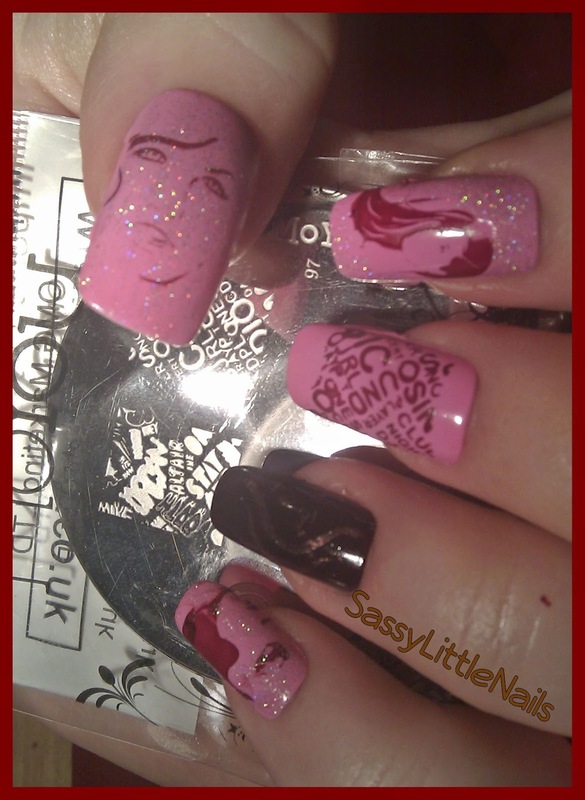 Last manicure is a fun looking nail art I really like! I used these 4 shades..
pink lemonade.great blue beyond.daffodil delight.tealed with a kiss. I started with the pink lemonade polish on half of each nail I painted it to a curve in the middle but it did not have to be neat at this point. then I did the other half using the great blue beyond polish. 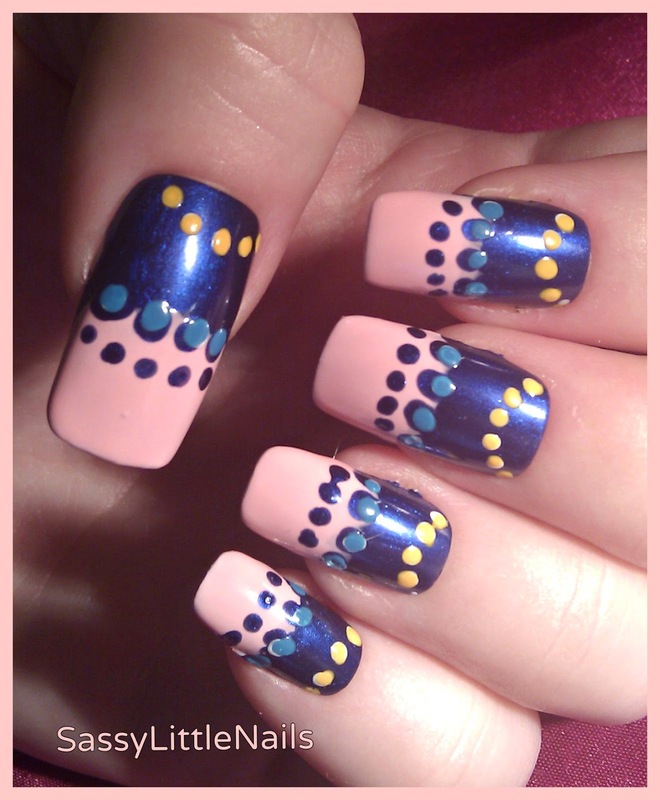 Using the medium size dotting tool I did some dots around the middle where the pink meets the blue. 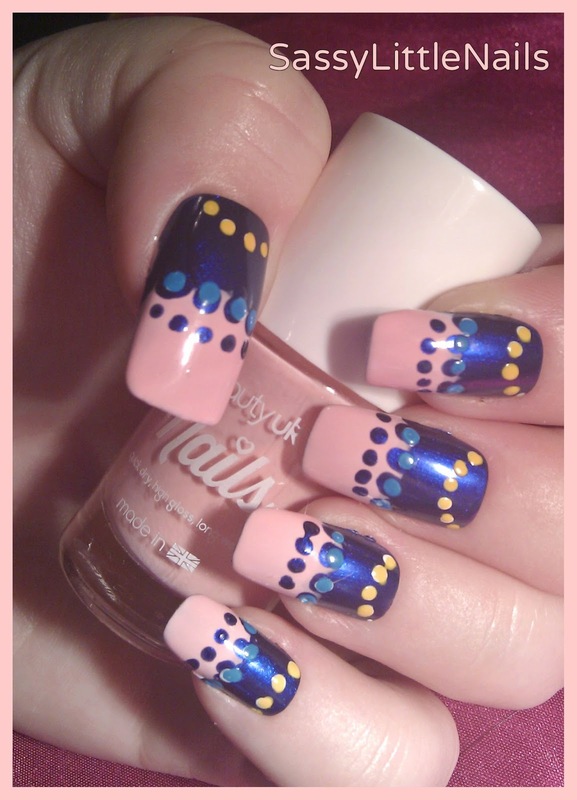 then with the smaller dotting tool I did some dots on the pink with the same blue shade. I took the daffodil polish and did 3 smaller dots on the blue waited for it to dry and then repeated the step until it was light enough. In the middle of the nails I went over the larger dots with the teal polish and there you have it all done! 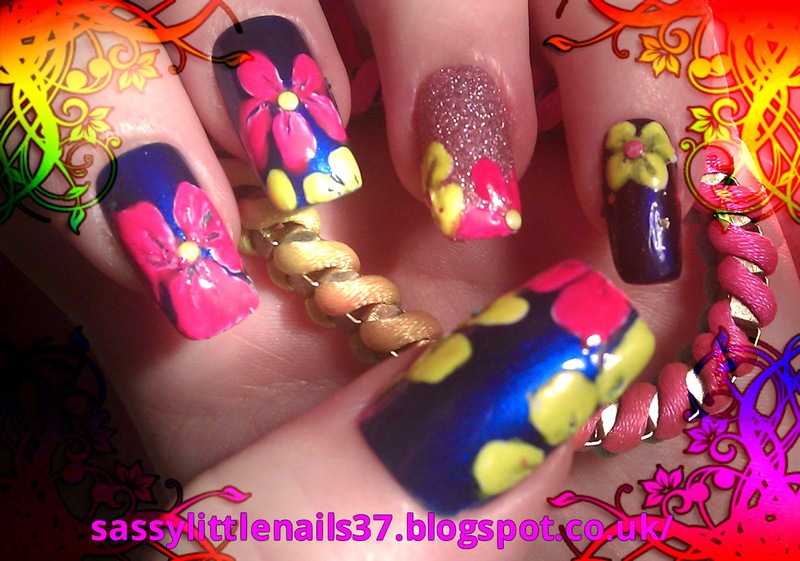 I hope you have enjoyed this beautyuk review and nail art! 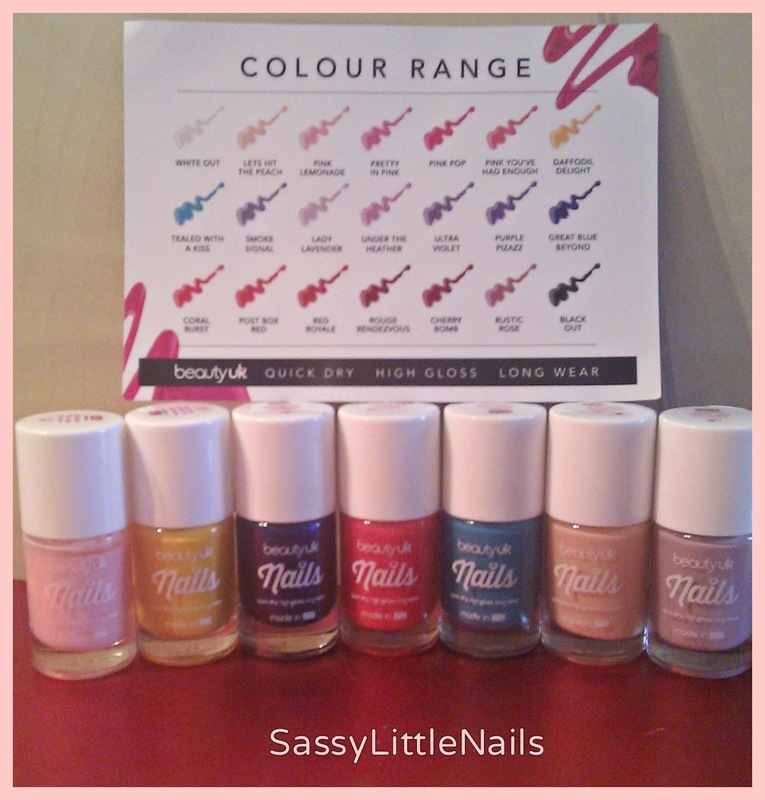 A huge thanks to Stephanie at beautyuk for sending me these lovely polishes to review and one brand new polish to giveaway!